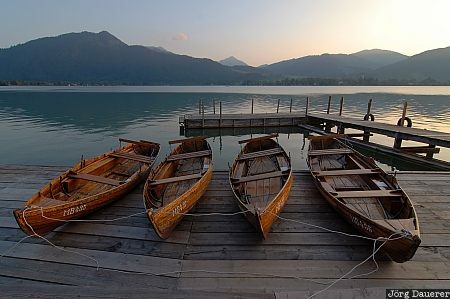 Boats at the shore of the alpine lake Tegernsee illuminated by the last light of the day. Tegernsee is in southern Bavaria (Regierungsbezirk Oberbayern), Germany. This photo was taken in the evening of a sunny day in June of 2006. This photo was taken with a digital camera.